This soup can also be made in a sauce pot on the stove. Two adjustments (using vegetable broth instead of beef and omitting anchovy paste) make this a satisfying vegetarian soup, so whatever your lifestyle, this hits the mark. First, brown onions in olive oil and then put in a slow cooker. Add the rest of the ingredients, set cooker to low and cook (3-4 hours). If you start this in early afternoon, it will be ready for supper. Before serving, blend lightly with a few pulses (don’t do this when soup is hot, it will blow out of the blender, trust me). In our house, we don’t want a fine puree, only medium, but do what your family likes. You can omit this step and simply serve the soup chunky. Garnish with one or more of these: fresh croutons. Basil leaves, fresh grated Parmesan cheese, drizzle with extra-virgin olive oil. 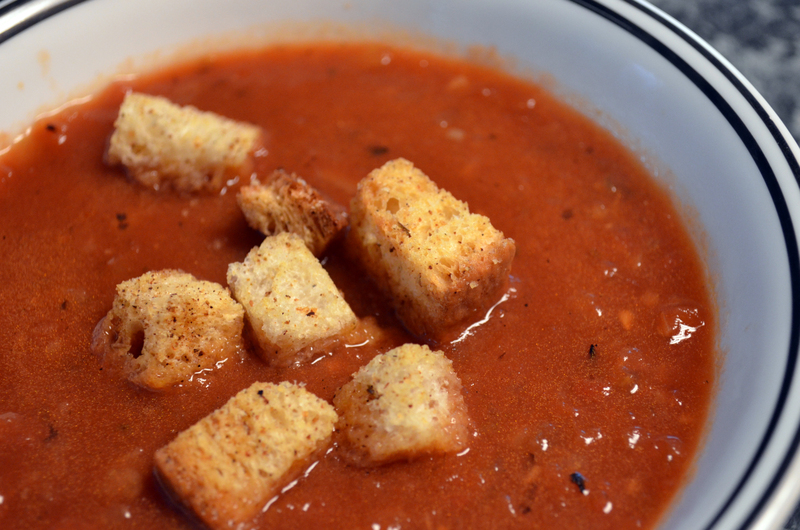 This entry was posted in recipes and tagged crockpot, slow cooker, tomato soup, vegetarian. Bookmark the permalink.